Why run film between your part and the horn? 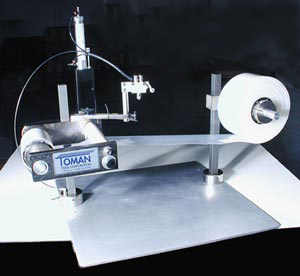 Film acts as a buffer, protecting the surface from damage. This prevents marking or burning of the part during ultrasonic welding. 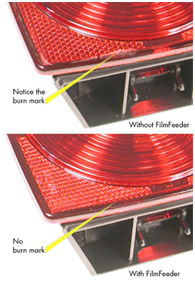 If the appearance of the welded part is a factor, then a Film Feeder is the right accessory for you. Choose the automatic unit or a manual unit, which can be upgraded to an automatic unit as your production increases. 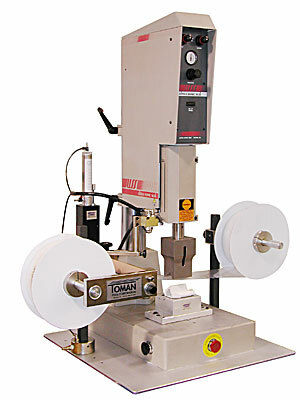 The Pneumatic Film Feeder will automatically feed a buffer film between the ultrasonic horn and the part being welded. This helps produce a smooth, unmarked product during ultrasonic welding. No more hand-fed plastic, and the savings in operation time or scrap parts will soon pay for this accessory. The Film Feeder base slides under most sonic welders with no alterations. Custom base plates are available to suit your particular application. Call for details.